September 24th was Yellowbelly Day! I didn't know it was going to be Yellowbelly Day, but that's the way it turned out. 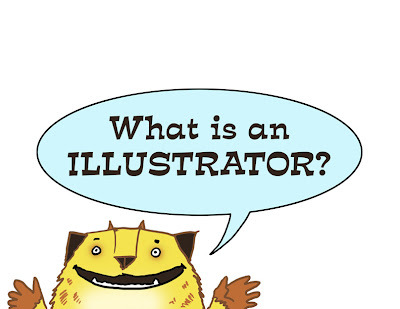 I visited Hayden Peak Elementary School and did a presentation about being an illustrator. Yellowbelly came along to help me out. He was there in my Powerpoint presentation. 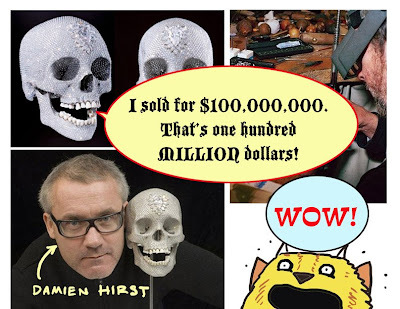 Here he is teaching kindergartners about Damien Hirst (but not too much about Damien Hirst.) This part of the presentation was about the differences between Fine Art and Illustration. Kids love that wacky diamond skull. 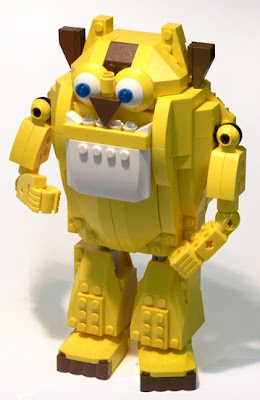 He even made an appearance in LEGO form. Look at him go! Don't ask about LEGO Plum--do you have any idea how rare purple LEGO bits are? (I'll have to make him out of blue.) Who should I try next? The red robot kid? The others might be too tricky. The school librarians at Hayden Peak had been reading Yellowbelly and Plum Go To School during library time over the past week. So when I got there and started talking Yellowbelly, the kids went INSANE. It was great to see some love for the furry yellow guy. It was tons of fun. And a nice break from the 24/7 CALAMITY JACK ink-o-thon. This is the week of the wig! The wig is now on it's way to NYC (Shannon, you better be wearing it on the plane! Or better yet, Dean!) The wig will appear on the TODAY SHOW this friday (Sept. 12, NBC) on Al Roker's Book of the Month segment. We are crossing our fingers and toes that Al himself will wear the wig. Making it the MOST FAMOUS WIG IN NORTH AMERICA for at least a few hours. Who doesn't want to see Rokerpunzel? I want me some Rokerpunzel! 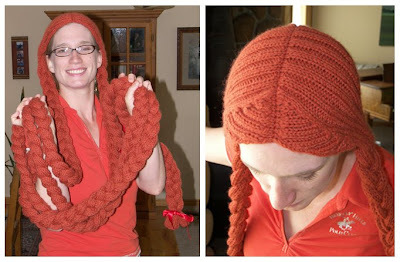 If you'd like to try making your own Rapunzel wig, Mindy say's the pattern is loosely based on the Hallowig by knitty.com. Good luck! The Epic Wig Post should be up later today, I'm still waiting on a few pieces of knitting information. What IS it? A trash can with a wing on the side? I remember hearing once that one of the model makers for Return of the Jedi glued some junk on his shoe and flew it through the background of one of the space battle scenes. I'm guessing that this is a tribute to that urban legend. A shoe with junk glued on it. Horrible. HORRIBLE. This set is called "The Twilight." What? Twilight? Is it full of vampires and chubby goth kids? 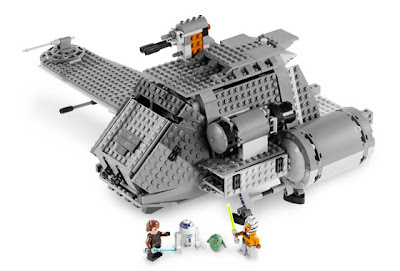 The real crusher is that this is a $100 set. I know I promised a post on the giant Rapunzel wig last week. 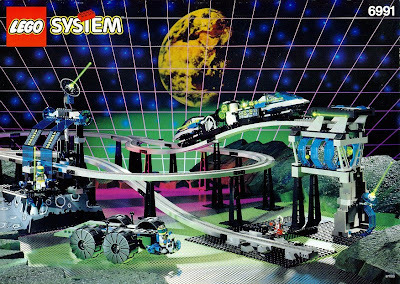 But it's been a hectic week at the space station. 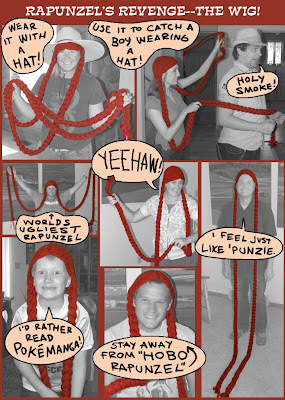 Coloring has begun on CALAMITY JACK, the sequel to RAPUNZEL'S REVENGE. 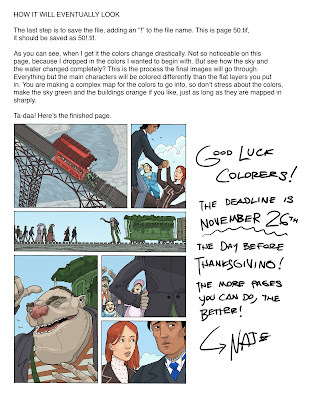 Coloring is the final step in my graphic novel work schedule. 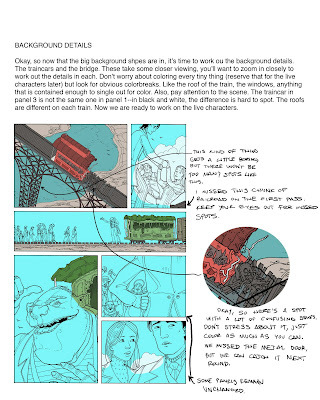 My order is: pencil sketches>lettering>ink>coloring. Unfortunately, the coloring tends to take the most time. For Rapunzel, I ended up coloring for four months straight. This year, I'm bringing in some help. I've got a team of five Color Mappers! They range from Photoshop experts to Photoshop beginners. 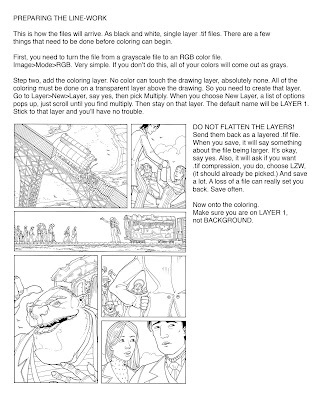 To clarify the process, and to help the beginners, I created a RAPUNZEL Coloring Tutorial. I made it for the color mappers, but I thought you might like to see it too. 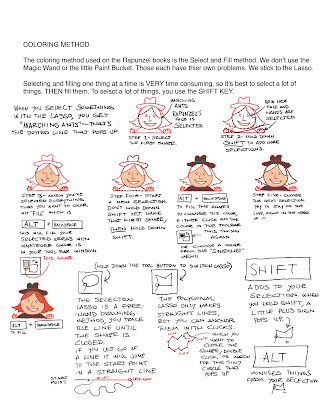 It features a sneak peek of CALAMITY JACK (possibly the most boring page in the book) and might be helpful to anyone who wanted a simple way to digitally color an ink drawing. 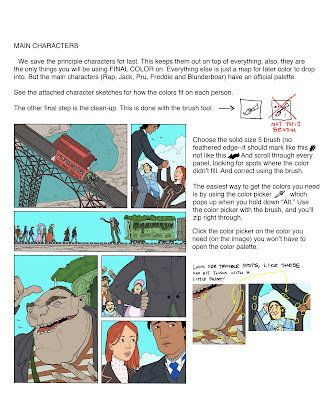 Now there are a million ways to lay out flat colors, this is just my method. It's based on my experience coloring Rapunzel, as well as a few different books. 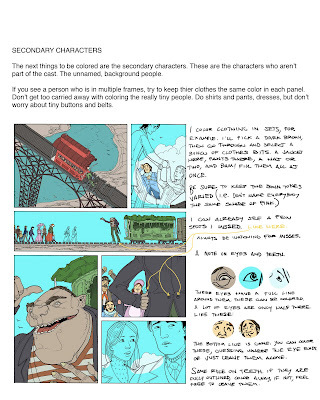 There was a mountain of valuable information in Mark Chiarello and Todd Klein's DC Comics Guide to Coloring and Lettering Comics, I also found some handy tricks in a book called Japanese Comickers 2. 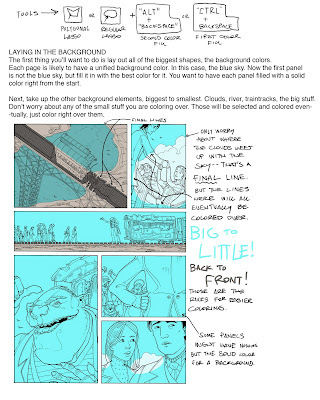 Okay, here's the tutorial--you'll have to click on each page to read the small print. I hope it comes in handy. Next post will be about the wig I promise.